Chili boh is a must have ingredient in most Malaysian kitchens. 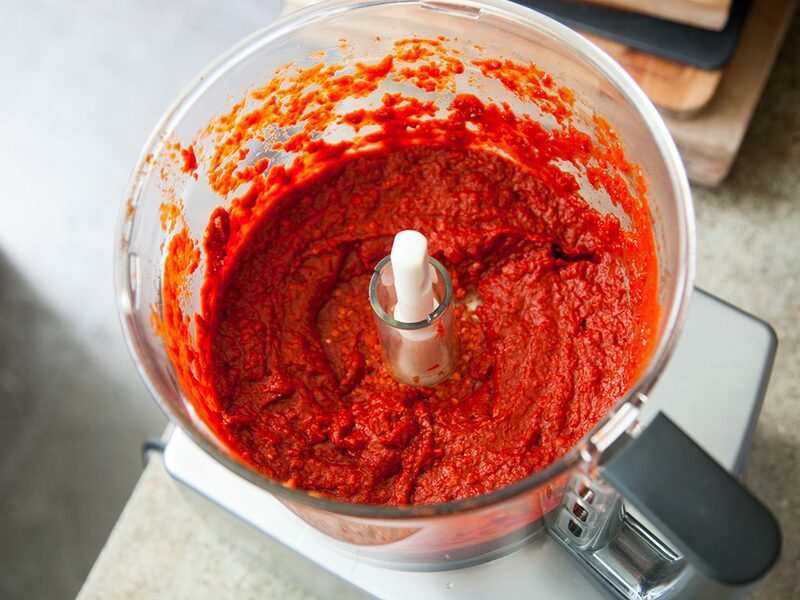 A thick red paste often kept in glass jars or tupperwares, you will usually find it kept in the far recesses of a home fridge or freezer, waiting to be dug out and used for the next recipe. 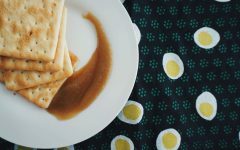 While it is possible to buy this ingredient readymade at most supermarkets and markets throughout the country, any cook or Chef worth their salt knows it’s always best when made from scratch. Plus, you never know what additives might be included in store bought chilli boh. 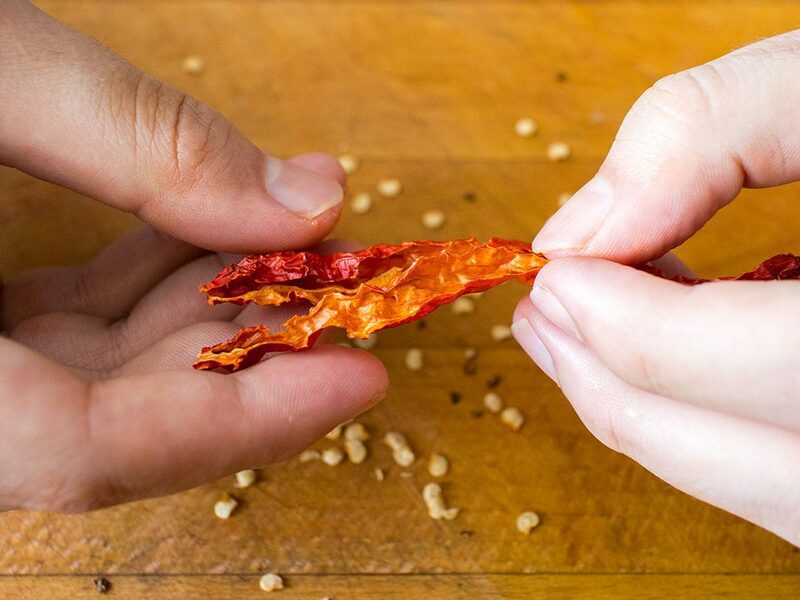 Generally, there is only one ingredient in chilli boh – crinkly dried chillies. 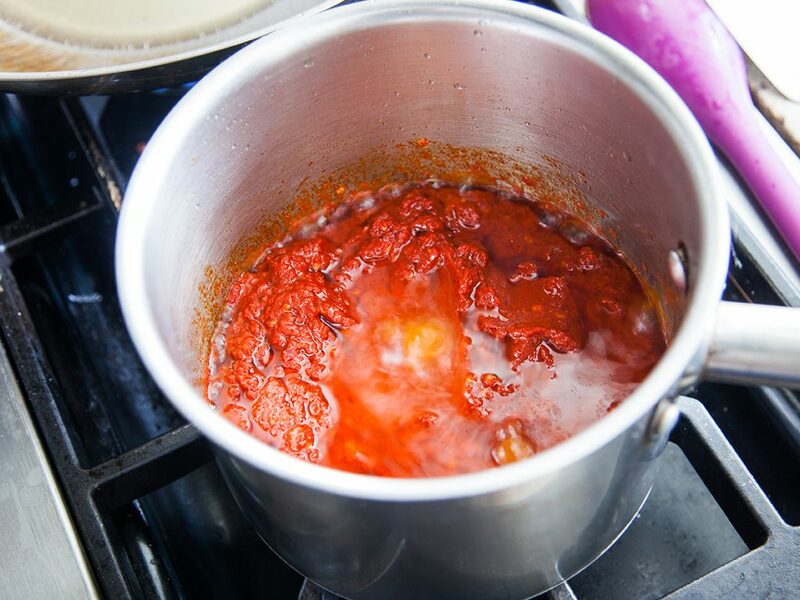 Some, however, add extra flavour by adding garlic, shallots or even ginger, especially if they plan to use their chilli paste for specific recipes. 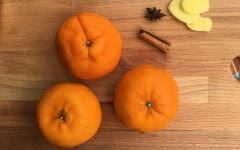 We’re going to teach you a very basic chilli boh that you can easily use for, well, any recipe requiring this ingredient (we have some on our website! Just search ‘chilli boh’ for ideas). 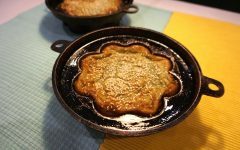 This is also a great item to make in bulk as it can be frozen and kept for up to three months. 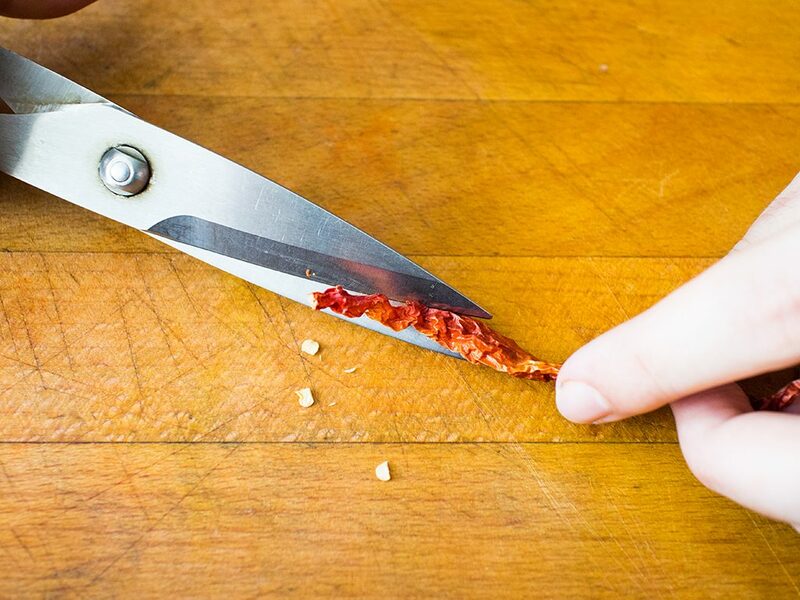 Use a pair of scissors to remove chilli heads and stems, then split chilli half lengthwise starting from the base (widest part) of the chilli as that is where the most seeds are. You don’t have to cut it completely in half. Instead, leave about 2 to 3cm from the chilli tip. Expose the seeds and shake the chilli for all it’s worth to get the seeds out. You can also pluck them out. 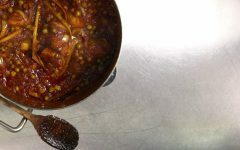 Remove as much of the seeds as possible, but it’s perfectly fine to leave a few stubborn seeds behind. Place deseeded dried chillies in a bowl. Soak and rinse about three or four times to remove dirt. Fill a pot with sufficient water to cover your chilli. Add rinsed chilli and bring to a boil over high heat. Then cover and let it boil for 30 minutes. 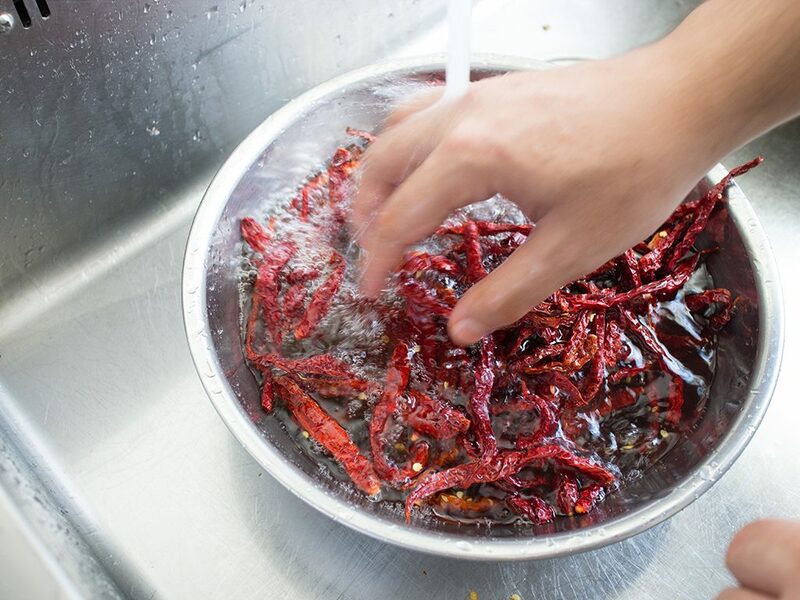 After 30 minutes, remove chilli from water with a pair of tongs or a sift. Give a few shakes to remove excess liquid. 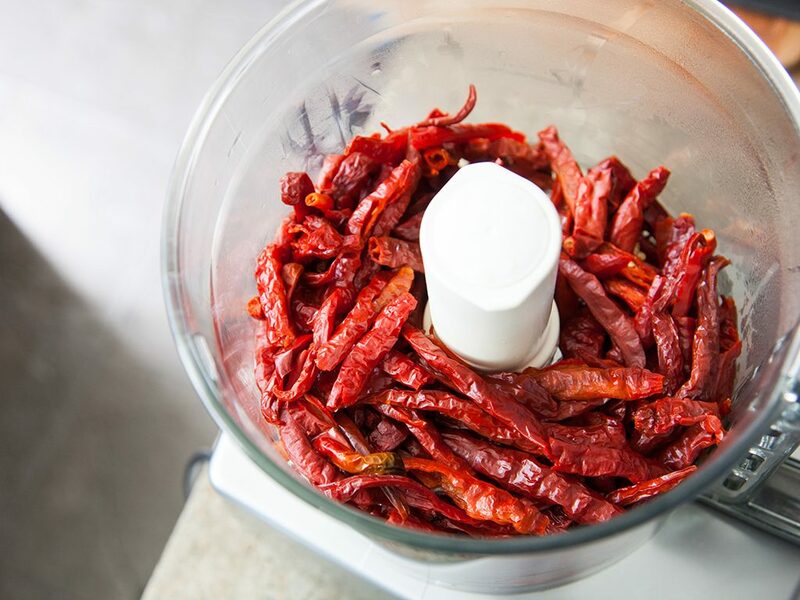 Transfer chilli to a food processor or blender. Blend until very fine. This might take awhile depending on your food processor. Add cooking oil to a pot and heat over high heat. Once the oil is hot, add blended chilli. Stir occasionally until the chilli and oil completely emulsifies, about 25 minutes. 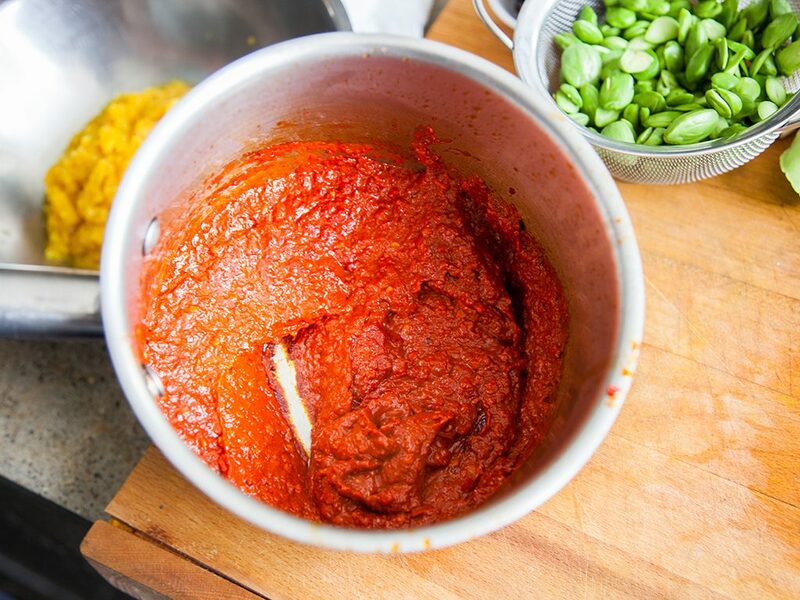 Don’t forget to scrape the bottom and sides of the pot to ensure the paste doesn’t burn. Let cool completely before transferring to an air tight jar or container. 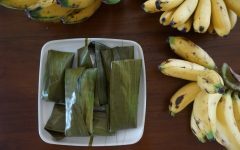 Freeze for up to three months or refrigerate for up to 1 month. Not enough time to whip up your chilli boh from scratch and need to use it now? Divide the weight of chilli boh needed by 4. That’s roughly how much deseeded dried chillies you’ll need. 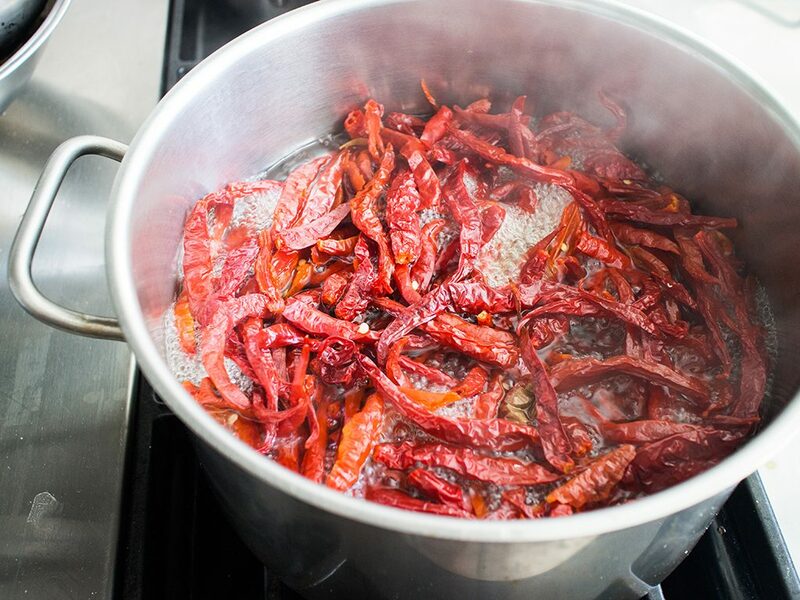 Soak deseeded dried chillies in freshly boiled water, keeping it covered for 15 minutes. 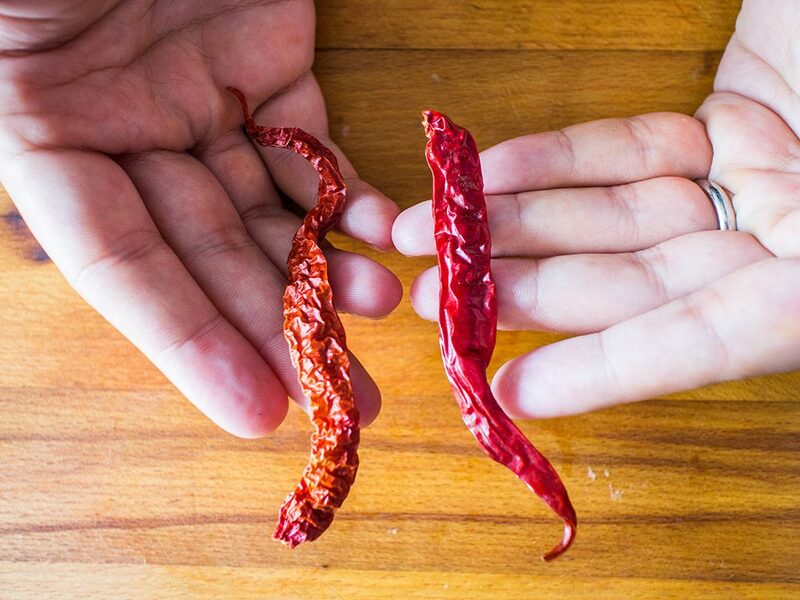 Discard water and measure your soaked chillies. You’ll want about 80% of the chilli boh required for your recipe. 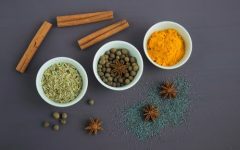 Blend it with your aromatic ingredients, for example, onions, garlic, ginger, galangal, etc. (based on the recipe you’re making). 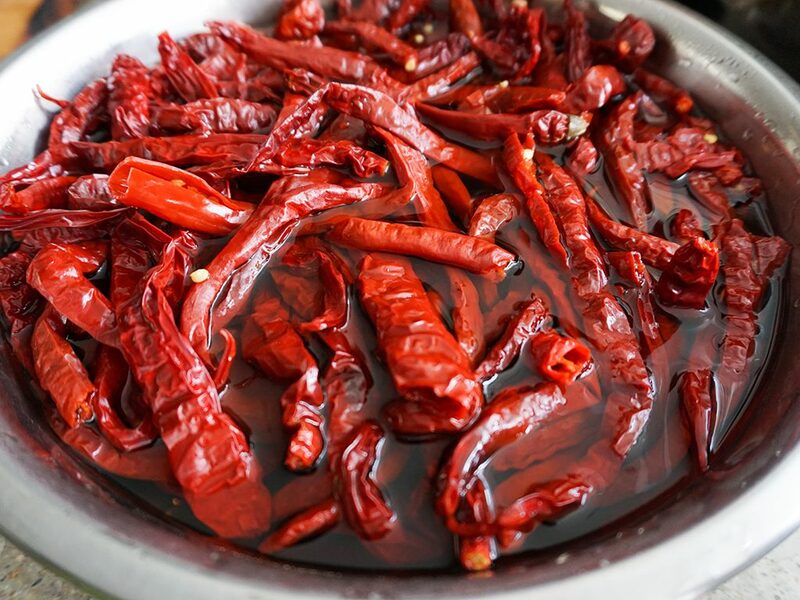 Thai dried chillies are great for making chilli boh. Generally though, if you can’t find them, go for the crinkliest option. 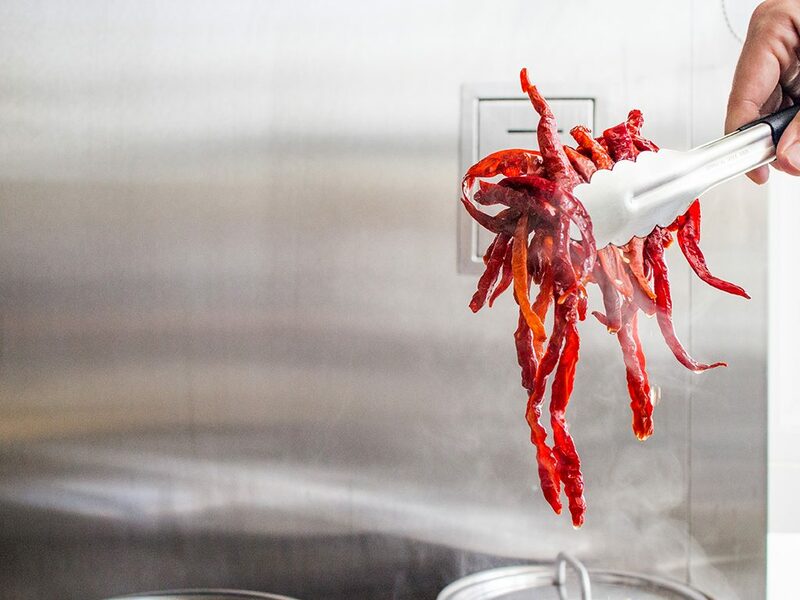 Be sure to wash your hands thoroughly after handling all that chilli. 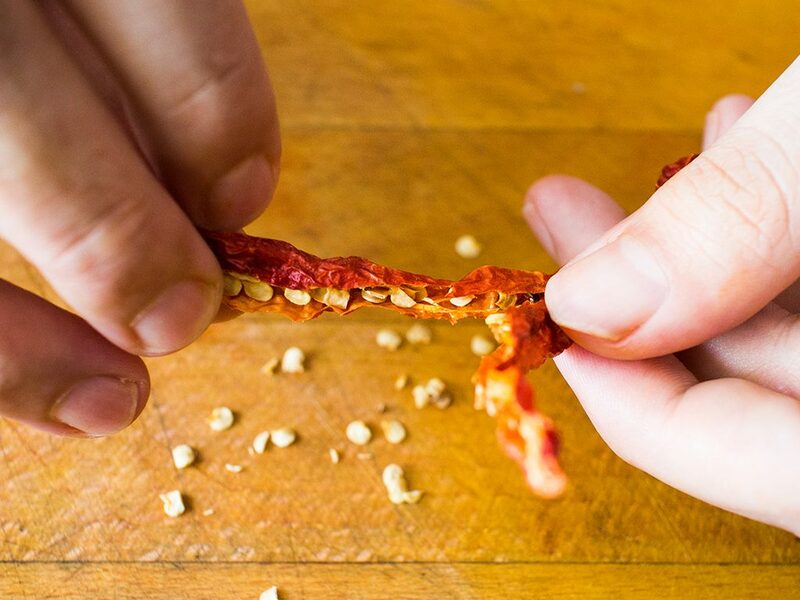 You don’t want to accidentally rub your eyes with chilli-exposed fingers! To be on the safe side, use gloves. 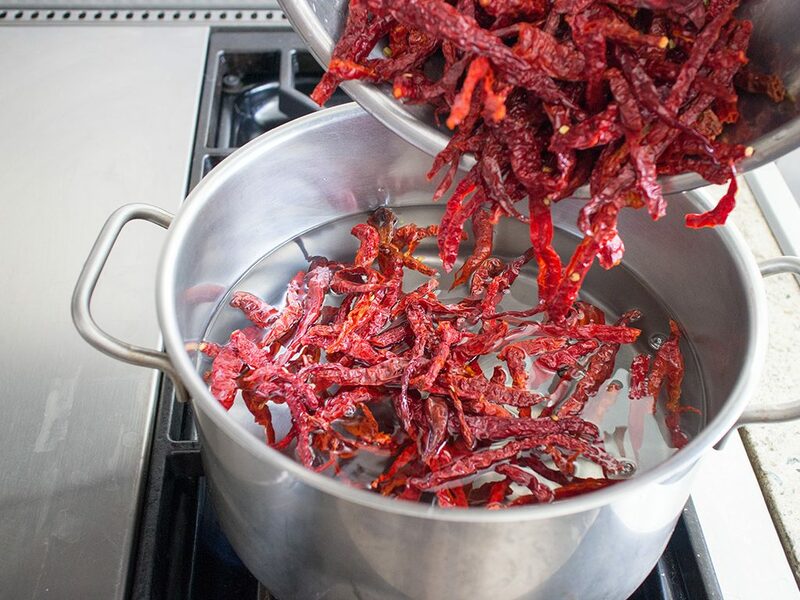 After the entire process, you’ll yield about 5x the weight in chilli boh compared to the weight of dried chillies you started out with. Keep this in mind! When using your stored chilli boh, always use a clean, dry spoon to avoid contaminating and spoiling it. Also, avoid defrosting the entire container of chilli paste unless you plan to use it all. Defrost only the amount you need. 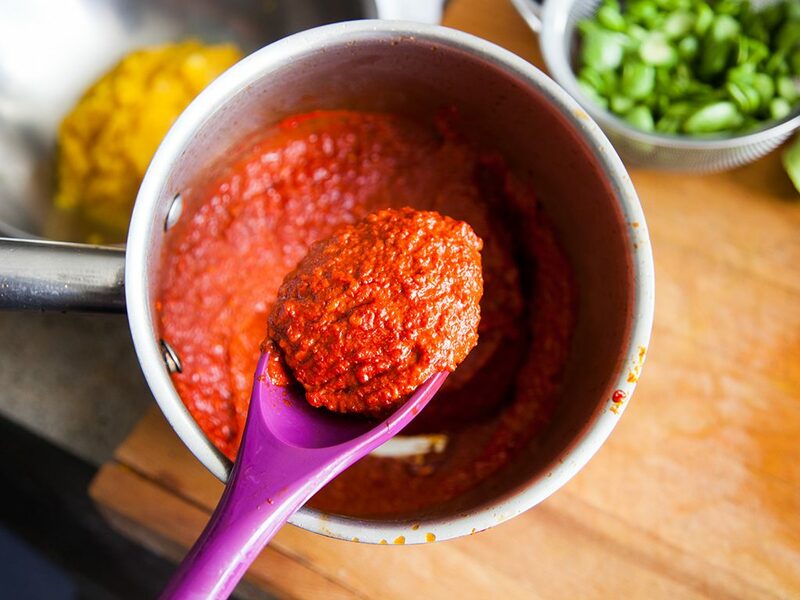 Now that your chilli boh is ready, what are you going to make? We’ve got some delicious recipe suggestions in the links below. 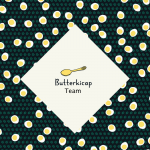 Don’t forget to share your pictures with us by hashtagging #butterkicap! Spicy Prawn and Petai Recipe to Whet your Appetite!